Jack Owens was born L. F. Nelson, and lived and worked in Bentonia. Owens was never a professional recording artist, but he farmed, bootlegged and ran a weekend juke joint in Bentonia for most of his life. He was not recorded until the blues revival of the 1960s. Owens was rediscovered by David Evans in 1966, who was led to him by either Skip James or Cornelius Bright. Evans recorded Owen’s first album Goin’ Up the Country that same year and It Must Have Been the Devil (with Bud Spires) in 1970. 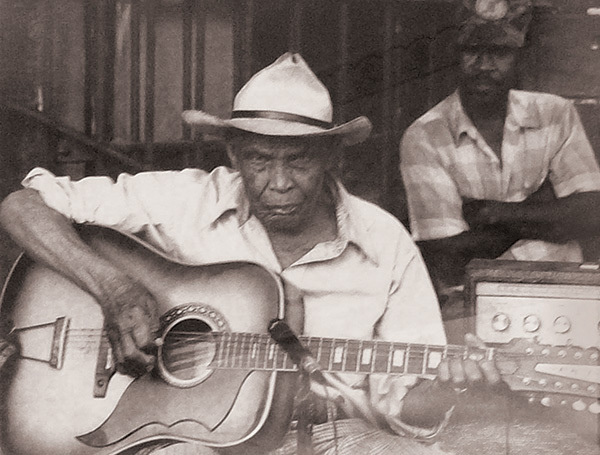 He made other recordings (some by Alan Lomax) in the 1960s and 1970s, and performed at several music festivals in the United States and Europe until his death in 1997. Owens shared many elements of his guitar style and repertoire with fellow Bentonian Skip James. He was often accompanied on harmonica by his friend Bud Spires. He won the W. C. Handy Award and often performed for visitors on the front porch of his farmhouse. One of his most unique performances was a 1995 Levi’s jeans commercial performed at the Blue Front Café.